Rich Habits Poor Habits is for anyone who seeks to secure their financial future but is unsure exactly what to do. Expert authors Tom Corley and Michael Yardney will show you how to walk in the footsteps of the wealthy. This practical guide will help you to create, grow and inves... read full description below. Rich Habits Poor Habits is for anyone who seeks to secure their financial future but is unsure exactly what to do. 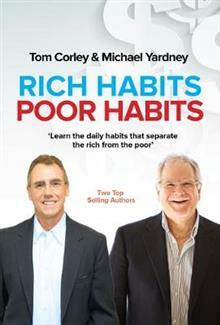 Expert authors Tom Corley and Michael Yardney will show you how to walk in the footsteps of the wealthy. This practical guide will help you to create, grow and invest your money just like the wealthy. Drawing on the proven investment strategies of Michael Yardney, Australia's leading authority on wealth creation and success, this book provides a clear and concise introduction to investing, giving investors of all levels the confidence to take control of their financial futures. American co-author, Tom Corley, will share with you his internationally acclaimed research on the daily habits of the rich and poor. You will learn about specific habits you must have in order to succeed and about habits that create poverty and must be avoided at all costs. In these tough economic times, people are looking for help in achieving financial success. Every person seeks prosperity for themselves and their families, and with Rich Habits Poor Habits the secret to financial success will be revealed. Join the Rich Habits financial success revolution. Tom Corleyunderstands the difference between being rich and poor: at age nine, his family went from being multi-millionaires to broke in just one night. As an adult, for five years, Tom observed and documented the daily activities of 233 wealthy people and 128 people struggling with poverty.A dynamic and empowering speaker, Tom travels the world, motivating audiences at industry conferences, corporate events, universities, multi-level marketing group events, and global sales organizations presentations and finance conferences. Tom is also a CPA, CFP, and holds a masters degree in taxation. As president of Cerefice and Company, CPAs, Tom heads one of the premier financial firms in New Jersey. Michael Yardneyis a #1 bestselling author and a leading expert in the psychology of success and wealth creation. His opinions are frequently quoted in the media as he challenges traditional finance advice with innovative ideas on investment, personal finance and wealth creation.Michaels wisdom stems from his substantial personal success and experience as well as from mentoring over 2,000 business people, investors and entrepreneurs over the last decade.